The measurement of earth resistance for an earth electrode system is very important. It should be done when the electrode is first installed, and then at periodic intervals thereafter. This ensures that the resistance-to-earth does not increase over time. There are two (2) methods for testing an electrical earthing system. The first is the 3-point or Fall-of- Potential method and the second is the Induced Frequency test or clamp-on method. 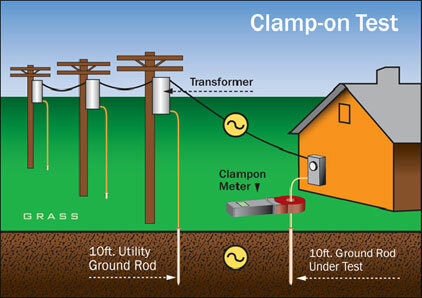 The 3-point test requires complete isolation from the power utility. Not just power isolation, but also removal of any neutral or other such earth connections extending outside the earthing system. This test is the most suitable test for large earthing systems and is also suitable for small electrodes. The induced frequency test can be performed while power is on and actually requires the utility to be connected to the earthing system under test. This test is accurate only for small electrodes, as it uses frequencies in the kiloHertz range, which see long conductors as inductive chokes and therefore do not reflect the 60 Hz resistance of the entire earthing system. 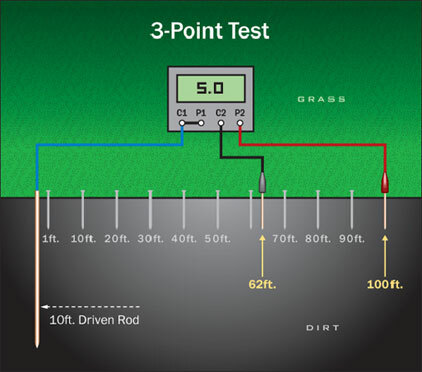 The 3-point or fall-of-potential method is used to measure the resistance-to-earth of existing earthing systems. 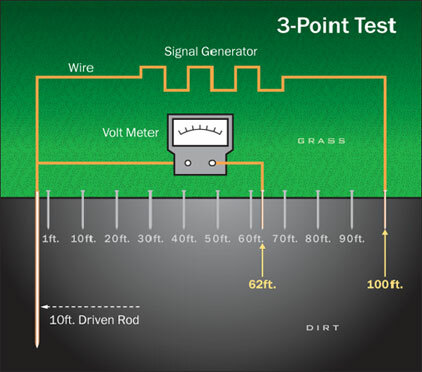 The two primary requirements to successfully complete this test are the ability to isolate the earthing system from the utility neutral and knowledge of the diagonal length of the earthing system (i.e. a 10’ x 10’ earthing ring would have a 14’ diagonal length). In this test, a short probe, referred to as probe Z, is driven into the earth at a distance of ten times (10X) the diagonal length of the earthing system (rod X). A second probe (Y) is placed in-line at a distance from rod X equal to the diagonal length of the earthing system. At this point, a known current is applied across X & Z, while the resulting voltage is measured across X & Y. Ohm’s Law can then be applied (R=V/I) to calculate the measured resistance. Probe Y is then moved out to a distance of 2X the diagonal length of the earthing system, in-line with X & Z, to repeat the resistance measurement at the new interval. This will continue, moving probe Y out to 3X, 4X, … 9X the diagonal length to complete the 3–point test with a total of nine (9) resistance measurements. 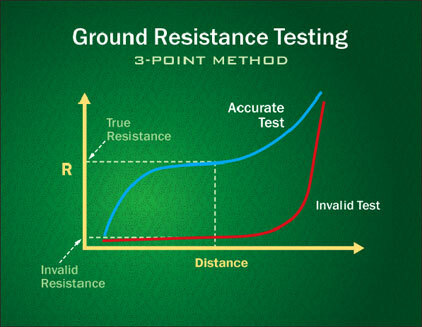 The 3-point test is evaluated by plotting the results as data points with the distance from rod X along the X-axis and the resistance measurements along the Y-axis to develop a curve. Roughly midway between the center of the electrode under test and the probe Z, a plateau or “flat spot” should be found, as shown in the graph. The resistance of this plateau (actually, the resistance measured at the location 62% from the center of the electrode under test, if the soil is perfectly homogeneous) is the resistance-to-earth of the tested earthing system. If no semblance of a plateau is found and the graph is observed to rise steadily the test is considered invalid. This can be due to the fact that probe Z was not placed far enough away from rod X, and can usually indicate that the diagonal length of the earthing system was not determined correctly. If the graph is observed to have a low plateau that extends the entire length and only rises at the last test point, then this also may be also considered invalid. This is because the utility or telecom neutral connection remains on the earthing system. The amount of amperage running through the tested system must be below the equipment manufacturer’s limits. The test signal must be injected at the proper location, so that the signal is forced through the earthing system and into the earth. This instrument actually measures the sum of the resistance of the earthing system under test and the impedance of the utility neutral earthing, including the neutral wiring. Due to the high frequency used, the impedance of the neutral wiring is non-negligible and can be greater than the earth resistance of a very low resistance earthing system, which can therefore not be measured accurately. The earth resistance of a large earthing system at 60 Hz can be significantly lower than at 1.7 kHz. Many erroneous tests have been conducted where the technician only measured metallic loops and not the true resistance-to-earth of the earthing system. The veracity of the Induced Frequency Test has been questioned due to testing errors, however when properly applied to a small to medium sized, self-standing earthing system, this test is rapid and reasonably accurate. The proper use of this test method requires the utility neutral to be connected to a wye-type transformer. The oscillating voltage is induced into the earthing system at a point where it will be forced into the soil and return through the utility neutral. Extreme caution must be taken at this point as erroneous readings and mistakes are often made. The most common of these occur when clamping on or inducing the oscillating voltage into the earthing system at a point where a continuous metallic path exists back to the point of the test. This can result in a continuity test being performed rather than a earth resistance test. Understanding the proper field application of this test is vital to obtaining accurate results. The induced frequency test can test earthing systems that are in use and does not require the interruption of service to take measurements. Earth resistance monitoring is the process of automated timed and/or continuous resistance-to earth measurement. These dedicated systems use the induced frequency test method to continuously monitor the performance of critical earthing systems. Some models may also provide automated data reporting. These new meters can measure resistance-to-earth and the current that flows on the earthing systems that are in use. Another benefit is that it does not require interruption of the electrical service to take these measurements.